The people of Invermere were taken by surprise this winter by a lake that froze sooner than expected. 50 people entered the Lake Windermere Ambassador’s “Catch the Freeze” contest to choose the date the lake would freeze, and guesses were on average much later than the 2012 contest. 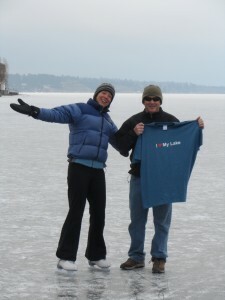 The lake froze on November 22nd, and the earliest, winning guess, provided by Steve Levitt of Invermere, was on November 23rd. Only four of 2013 guesses were in November, and half of the guesses were December 13th or later. November freeze dates are common for Lake Windermere, but the warm temps in early November must have had most of the valley fooled!